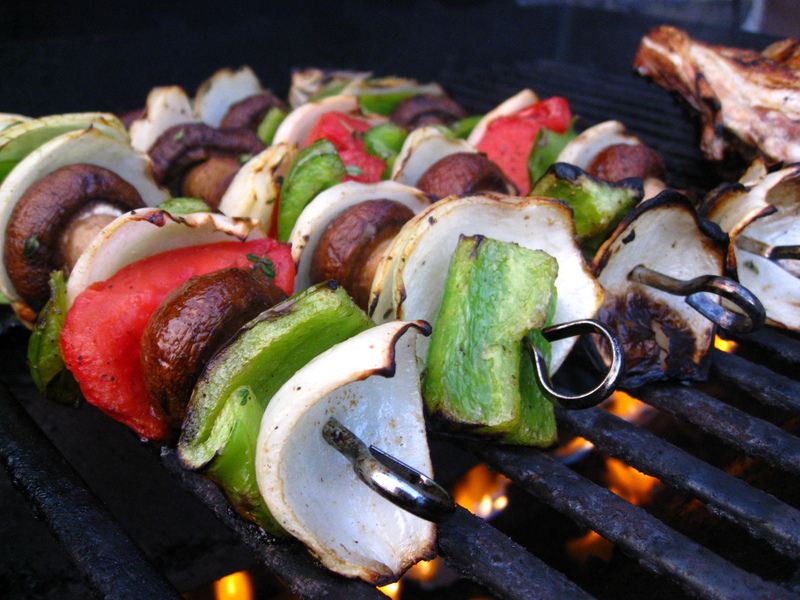 You can easily add chicken, lamb, beef or whatever favorite grill meat you choose to this kabob recipe, but when it’s mid-summer and vegetables are at their peak, I just enjoy focusing on the fresh farmer’s bounty with this vegetarian grilling recipe. To spice this up a little I like to add some fresh thyme, a little cumin seasoning and make a yogurt sauce to drizzle over the sweet, blistered veg. It’s very easy to make and only takes a few minutes on the grill before you can enjoy this meal. Preheat grill to medium heat. If using whole tomatoes, cut each into quarters and then cut each quarter in half again so you have pieces about 1-inch in size. If using grape or cherry tomatoes, leave whole. Cut pepper into 1-inch pieces, removing the stem and seeds. Quarter the onion and separate the layers. 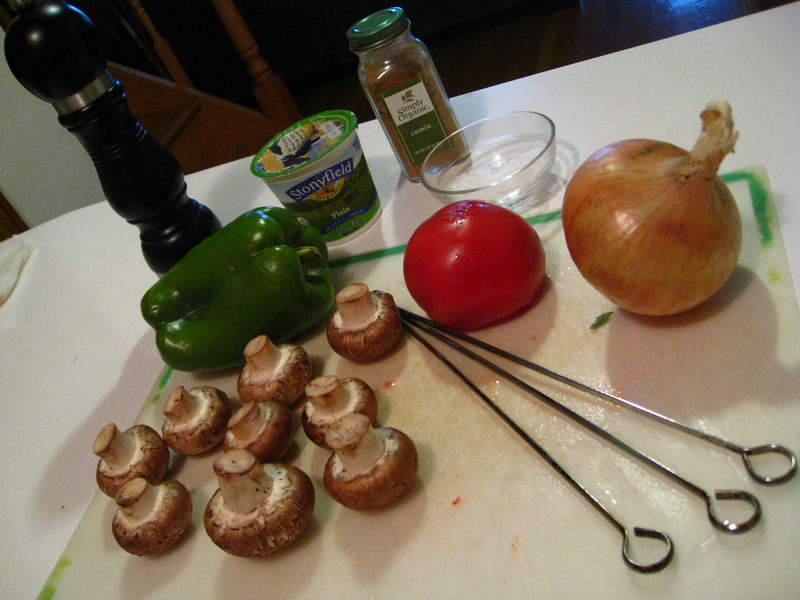 Toss all vegetables in a medium bowl with olive oil, fresh thyme, cumin, salt and pepper until thoroughly coated. Take a skewer and alternate colors and vegetables so you get a good variety. Once the grill is hot, place skews on the BBQ and cook for ~10 minutes, turning frequently to make sure to get a good charred edge on each side. This will add to the overall flavor! While the kabobs are grilling, add the cumin, salt and pepper to the yogurt and stir well to mix evenly. Once the kabobs are done, drizzle with the yogurt sauce and either serve alone, as a side or inside a fresh pita. These kabobs look incredible . . . what a healthy summertime dinner. Thanks for the recipe. Your roommates must be lucky to have you around!